I've been sick for the last week or so, but that's just given the garden some time to grow a bit and surprise me! In the course of a week and a half we've had a lot of rain, heat and humidity, so upon returning to "The Rainforest Garden" at my parent's place I was blown away by the growth! Not only was the grass lush and emerald green, weeds that were nonexistent two weeks ago were now up to my knee and flowering. I yanked up as many as I could, but can take solace in the fact that all of my intentionally planted specimens were coming up just as fast as the weeds themselves. In the photo above you can see my tried and true cardomom ginger to the left, and my more recent yellow anise and Philodendron "Evansii", which happens to be turning out new leaves. 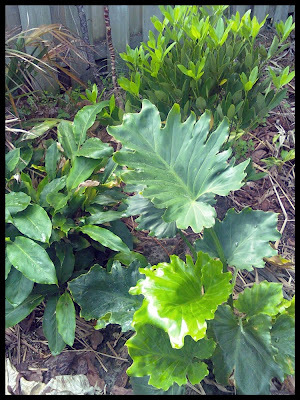 As you can see, my chartreuse colocasias are coming back strong as ever. They do a wonderful job of brightening shady corners in my garden and tolerate flooding with ease. As I mentioned in my last post, the monstera is returning as well. Its gone from having tiny curled up leaves to having new leaves 6 inches long in a matter of two weeks, so I'm sure that its going to reclaim its former grandeur. 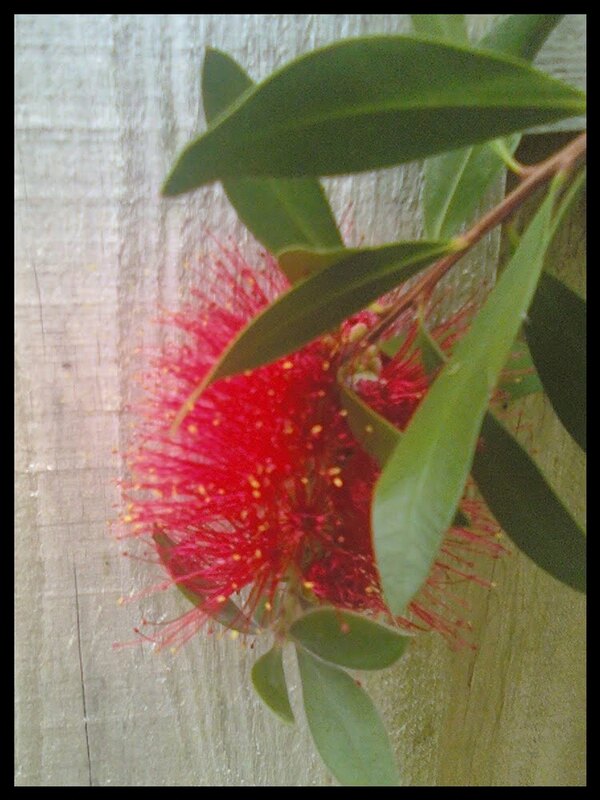 The unidentified bottlebrush I had mentioned earlier seems too be a weeping bottlebrush, callistemon viminalis. Some neighbors have one that was also hit really hard by the freeze, and I can testify that the branches tend to have that weeping habit. Does anyone want to weigh in on my identification now that I have a photo of a flower? I do seem to recall that the weeping bottlebrush has softer looking flowers than my callistemon citrinus, so I dunno. While I was sick I mustered up the energy to do only two garden related activities. My "Mother's Day Cactus" as I call it, has bloomed, so I managed to take some photos of its beautiful red blooms. Of course its even more exciting to me since they're from inch long cuttings and are growing totally epiphytically on a chunk of tree fern. See my Rainforest in a Centerpiece post for more on that. 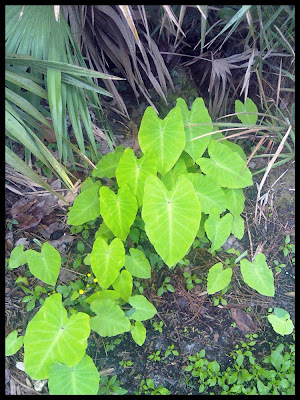 By the way, I found some other things in the garden returning today: My little rubber ficus plant (ficus decora) is coming back from the roots and my south Florida native leather fern is putting out new fronds too. Thunbergia Erecta, Hibiscus and Firebush are returning as well, so things are starting to look pretty lush all over again. 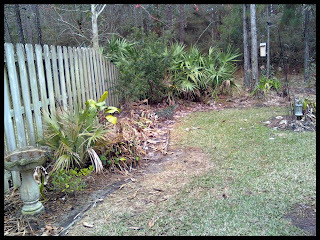 Here's a photo of the garden in January, followed by a pic of the garden today. Ewww... I'm glad I planted another evergreen shrub/tree here to keep it petty in winter. 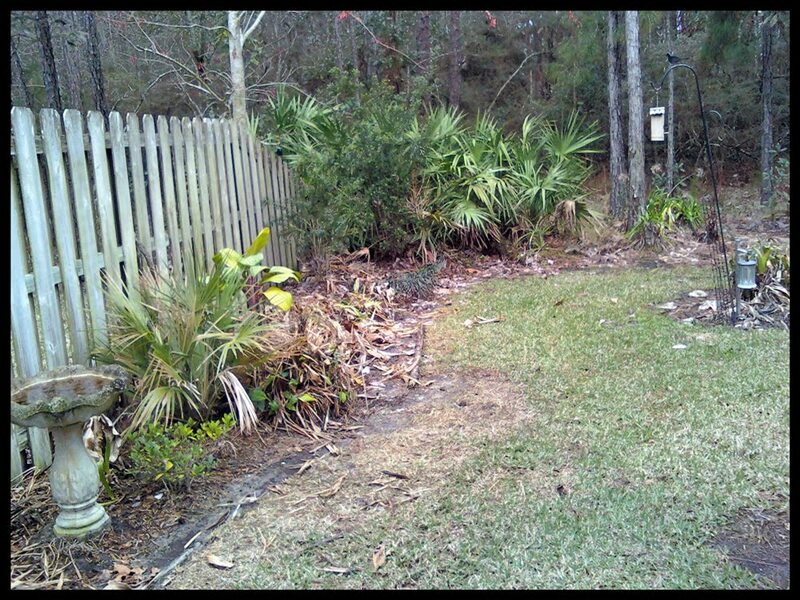 My Yellow Anise will also serve as cold protection for plants underneath, forming a canopy in a few years with the bottlebrushes, wax myrtle, dahoon holly and yaupon hollies. Now lets see what it looks like today! Yay! 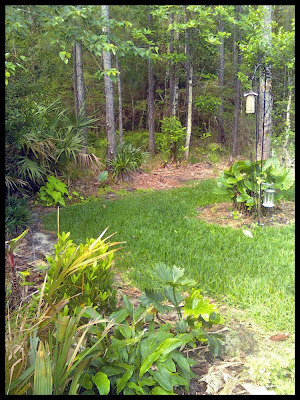 The butterflies, hummingbirds, lizards and frogs are out in full force as if to prove that the garden is a home again. My dad even found a little ringneck snake, and our local blue tailed skink has returned to his summer home, the wheelchair ramp. I feel like a kid again out here. Glad that you are recovering from the sickness. But the garden surprise is a good comfort after that! 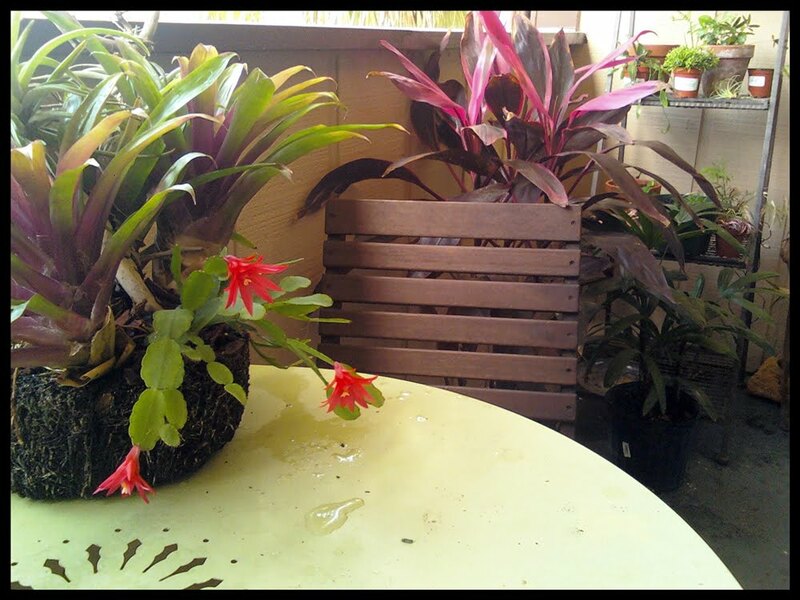 That "mother's day cactus" looks lovely with the pretty flowers. I think this cactus often a little confused. I also got them blooming last month, even not as prolific as the winter time. welcome back, hope you are feeling better, sometimes it is good to take a little break and then be pleasantly surprised when you look around at what has happened in your absence. I like your rainforest in a centerpiece. Sorry to hear you've been sick, but happy to know the garden is springing back to life! Things are changing so quickly in the garden with the tropical weather finally returned. Love that mini-rainforest as well, especially the broms. Congratulations of returning to your tropical slice of heaven!!! Sorry that you were sick earlier. But it is good to hear that you are better now. The pink banana tree is going to one nice tropical tree later... I am so excited for you! Yeah, better let it grow bigger before putting outside. What a nice find. Oh, congrats on the cactus blooms - they are so pretty! So glad you are feeling better. What a nice treat to find the garden doing so well. I love your 'rainforest in a centerpiece.' And to have a Mother's day bloom on your cactus is pretty special. Sorry to hear you were sick, but glad you're on the mend. I was just walking around my neighbor's yard, and pondering the fact that it hardly looks like we just came through a bad winter. The plants are really bouncing back nicely...hurray! Lovely pics - the chartreuse colocasias is really nice. Glad the garden is doing well, but I'm not into creepy crawlies esp snakes.. eww!